Lowell, MI – I landed at JFK on this day 28 years ago to live permanently in the USA with my family. We had two days to get from NYC to Big Rapids to be home for Christmas. My dad Vaclav Konecny, former math professor at Ferris State University, did all the driving through New York City and on the treacherous turnpike to Michigan. I will never forget this road trip in mom’s station wagon with frozen formations on the windows across five states. My mom Ella in anticipation of our arrival from former Czechoslovakia did all the prep work in the kitchen. This included the traditional Christmas Eve dinner that consists of a mushroom soup, fried fish with potato salad and traditional Czech pastries. I knew immediately what I missed. Since everything was ready, there were no smells in the suburban house, no scents of Christmas. I associate Czech Christmas with the aroma of vanilla crescents, hot chocolate that tops all filled pastries and browned mushrooms from the soup. Since the Czechs put up their Christmas trees on Christmas Eve, you also get the smell of a fresh-cut pine tree. After 28 years, I try to keep up with all the traditions of a true Czech Christmas. The only one that I had permanently dropped is putting up the tree on Christmas Eve. Other than that we adhere to the ritual of fasting on Dec. 24th in order to see the golden pig on the wall according to an old legend. Mom bakes kolache for the Christmas Day breakfast, daughter-in-law Maranda and “recreate” traditional Czech pastries like chocolate covered “baskets” and Linzer cookies. We open up gifts on Christmas Eve and we go to the midnight mass with carols. Our son Jake plays Christmas songs on the saxophone, I accompany him on the piano. On Christmas Day, we mostly eat and drink, just like everyone else. around the world. We do the visiting on Dec. 26th which is the official second holiday of Christmas known as St. Stephan Day in the old country. With this rather brief account of a traditional Czech Christmas, I would like to wish everyone a truly peaceful holiday season. 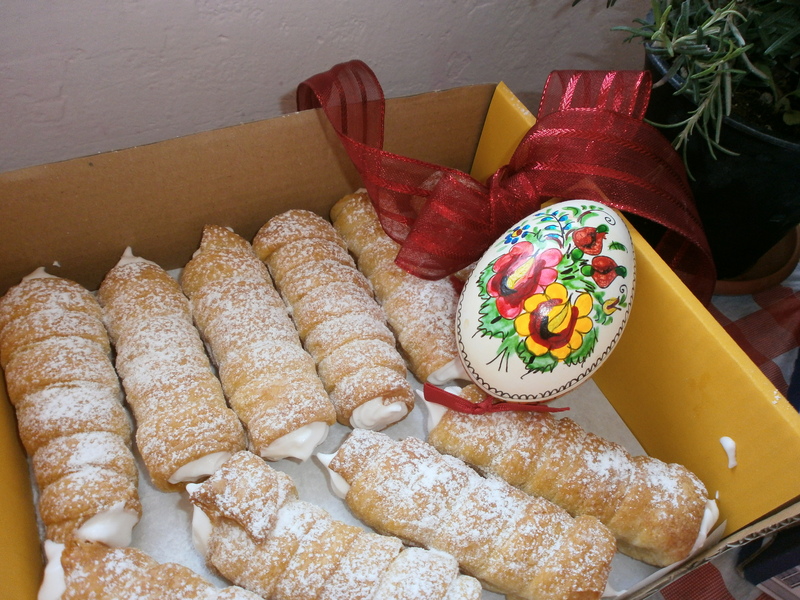 I have to run to bake some vanilla crescents, so I have the scent of a Czech Christmas in the house. Plus Jake called that they ate all the Christmas cookies Maranda had made. A sincere thank you to all my friends and fans. A tour of the embassies in Washington D.C.
Washington D.D. – Growing up, you were always told that it’s impossible to be in two places at once, especially two different countries that are oceans apart. But what if that’s not true after all? What if I told you that I was in eleven countries during the course of one day and eight countries the following weekend? On the first two Saturdays of every May, a large number of foreign embassies in Washington, DC open their doors to the public from 10 am to 4 pm. This year had 42 countries from Afghanistan to Zimbabwe participating in the Around the World weekend and all 28 countries of the European Union for the EU weekend. Since you couldn’t possibly fit in seven per hour one weekend and almost five per hour the next, planning ahead is the best approach. Thankfully, a majority of the countries are within easy walking distance of each other on or near a section of Massachusetts Avenue known as Embassy Row. Pictured above are dancers from Estonia and a stamped passport from the cultural tour around the world embassies in Washington D.C. in May. The enormous German Embassy is considerably off the beaten path, but the EU weekend had shuttle buses to make it easier to get there and to other groupings of embassies that are several blocks away from Massachusetts Ave.
For the Around the World weekend, the best starting point is Dupont Circle where the friendly folks from Cultural Tourism DC will give you a map showing the locations of all participating embassies, and you can also buy an official Cultural Tourism DC Passport for $5 to have stamped at each country you visit. For the EU weekend, the European Union Delegation building is within sight of Foggy Bottom Metro, and they’ll be happy to give you your map, free passport, and various other “I Love EU” goodies. The moment you step through the door of any of the embassies, you have legally departed the United States and are in Sri Lanka, Morocco, Latvia, or whichever country owns the site. Many of the buildings are posh Beaux Arts mansions constructed during the Gilded Age by contemporaries of the Vanderbilts and Rockefellers. Colombia and Chile both have lavish grand staircases that you can’t help but imagine a woman in a turn of the century ball gown with long gloves gracefully descending. They’re showing off a lot more than extravagant architecture and furnishings though. This event is all about exposing visitors to their culture, music, art, history, food, and people. Travelers who dropped by Morocco truly felt transported across the Atlantic. Their courtyard was transformed with large cushions placed on beautiful carpets under tents. Ladies in attire quintessential to West Africa offered small pastries similar to baklava and hot tea from a gorgeous silver teapot while live music was played. Henna tattoos were also available there for a fee. A top destination of the Around the World Embassies for foodies was Chile. They offered samples of bread dipped in olive oil with herbs, red and white wine, mussels flavored with cilantro, several types of fruit, and pisco sour cocktails. Lovers of dance particularly enjoyed the Kyrgyz Republic. A trio of ladies periodically performed choreography typical of their country. Elements of Bollywood integrated seamlessly with movements similar to those used in belly dance with a hint of Russian influence. In Estonia, dancers were not only performing, but inviting members of the crowd to participate and learn how to do something a little like a mix of English Country Dance popular in the 19th century and Polka. The Latvians got some entertaining reactions from sharing samples of their traditional beverages. To be fair, they did warn innocent victims that the herbal liquor called Black Balsam was very strong. Many Americans still were a little unprepared for the 90 proof liquid blending spices and pure vodka. Those visitors who are familiar with the Czech Republic’s Becherovka, on the other hand, found it to be delightful. For those who are intrigued by a particular region but are hesitant to travel there due to safety concerns, this is a perfect alternative. As a single woman, I would not feel comfortable traveling to Iraq or Afghanistan, but I found the embassies to be charming and the people exceptionally friendly. Notably, in the Iraqi Embassy, a woman in a stunning traditional dress was selling paintings of her homeland. When she’s not painting, she’s a forensic toxicologist here in the United States. She loves the country of her birth, but she is very excited about soon receiving her permanent Green Card. Traveling around the world gives a unique opportunity to expand a person’s horizons and help them appreciate the beauty in our differences and in similarities they may never have imagined previously. Passport DC gives the opportunity to get a bite sized vacation to countries that many people would not ordinarily think of when planning their next trip, and in some cases, countries that most Americans have never even heard of. Want to see the world but don’t want to spend hours on planes or trying to recover from jet lag? The first two weekends of May in Washington, DC make it simple. This is your chance to prove your physics teacher wrong because thanks to this event, you really can be in Europe, Asia, Africa, the Caribbean, the Middle East, and South America without ever leaving the capital of the United States. The featured photo: The Luxembourg Embassy in Washington D.C. Grand Duchess Charlotte of Luxembourg stayed after the Nazis invaded her country in WWII. Now this was a brassy happening Brassy in Washington D.C.
Coyright (c) 2017 Emma Blogs, LLC. All rights reserved. cultural tourismSarah Harmon writerWashington D.C.
Bannister, MI- No matter how long I’ve lived in North America, I still sometimes miss my home country, the Czech Republic. It’s hard to pin point what exactly am I missing? My whole family, except for daughter Emma Chavent, lives here in Michigan. Although, we don’t have family reunions, we often visit with each other. We all speak the Czech language including our youngest granddaughter Josephine Marie Palova. She was born in Kalamazoo in 2013 to American mother and to son Jake. So, it isn’t just the language that I miss. Sometimes, I think it’s the food. But, that can’t be right, both my husband Ludek and I can cook any Czech meal. We usually cook Czech food on Sundays. The perfect Czech Sunday meal are either schnitzels or pork, cabbage and dumplings. 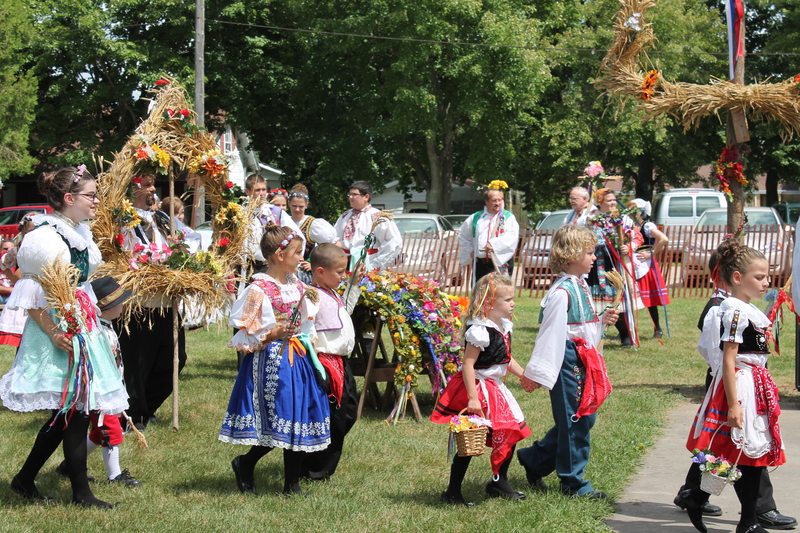 Every August, we go to the Czechoslovak Harvest Festival held in Bannister, MI. ZCBJ Lodge #225 in Bannister organizes the annual event. 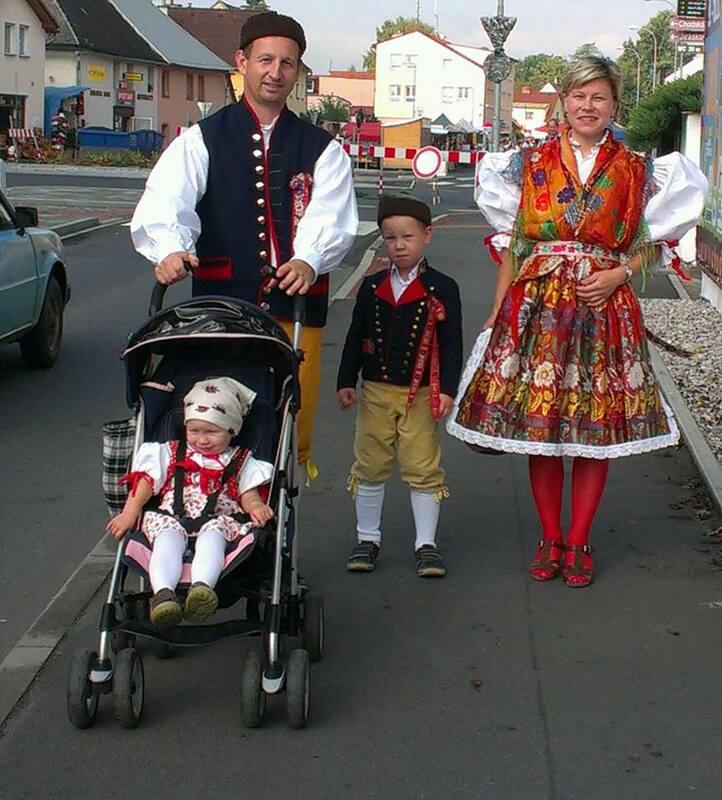 We do this to remind ourselves, our kids and grandchildren of our Czech origins. French-born Ella Chavent enjoyed the festival for the first time. She has never seen the traditional Czech and Slovak festive costumes or the dances. Ella marveled both at the dances and the music. She loved the full Czech fare that consisted of ham, fried chicken, mashed potatoes, dumplings, cabbage, cucumber salad and Czech desserts. As in most countries, the food and the desserts are the pride of that particular nation. The ZCBJ Bannister lodge volunteers have cooked the delicious spread since 1976. Although somewhat modified, the food carries the Czech staples of dumplings, cabbage and cucumber salad. The dance troop celebrated 40th anniversary under the leadership of Diane and Tom Bradley. Another group played the accordions, a common instrument for the Polka music. Every year, I am flabbergasted by the dedication of the organizers to the Czech culture. Although, they are of Czech origin, most of them have never visited Czech or Slovak republics. Their meticulous research has brought them closer to the country located in the heart of Europe, thousands of miles away from the American shore. Czech & Slovak dances at Harvest Festival. The dedication also shows in the compiled recipes in the Czech anniversary cookbooks. Most recipes are in memory of loved ones. A Polka brass band accompanies the mass at the Cyril & Methodius Catholic Church. The dance troop also dances polka and other Czech dances. 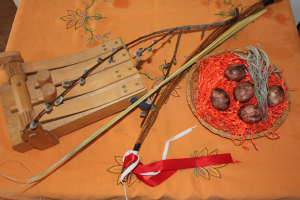 What makes the Czechoslovak Harvest Festival even more special is the fact that such events are dying out in the old country as the older generation passes on. “Lodge Michigan #225 has been fortunate to have members who willingly give of themselves, who live not in the past, but rather use the past to build for the future,” the festival program reads. “Vitejte holka na Dozinky,” Tom Bradley greeted Ella in Czech. I used to worry about the future of this Czech event that annually takes place in the middle nowhere, not close to Lansing and not close to Grand Rapids. Since yesterday, I don’t worry anymore. I saw young blood everywhere; from the dancers to the accordion players. Among the visitors were a lot of young people, who probably have never seen anything like the traditional costumed dances. The event closes with a dance for the public inside the ZCBJ Lodge. The lodge itself is a feast for the eyes. It has a traditional stage for the Polka band. Paintings from Czech history decorate the walls of the 1916 hall. Thanks to all the volunteers for keeping the Czech tradition in Midwest alive. The next Czechoslovak Harvest Festival in Bannister will be held on Aug. 6th, 2017. For more information visit www.zcbjbannister.org or find them on Facebook. You can also rent the hall for events. Contact Ann VanDeusen at 1-(989) 534-1862. A note to my regular readers. I am participating in a Content Writing challenge by Learn to Blog. The posts show my views on today’s world including my own. I hope you enjoy all of them as part of stepping up my blogging. 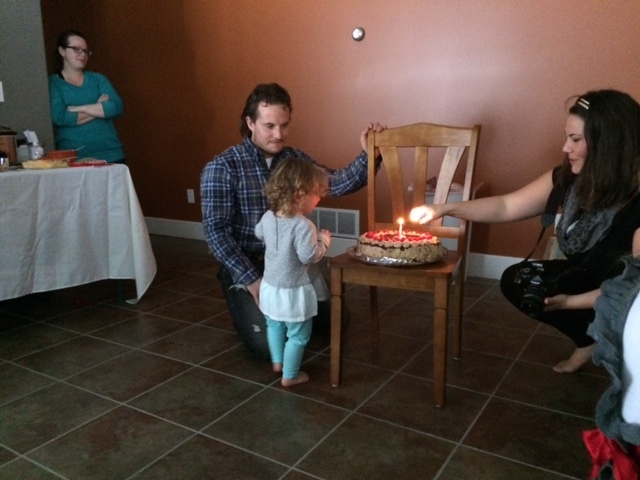 Hastings, MI- Today we celebrated my girl’s second birthday. Josephine Marie Palova was born to a multi-cultural family. My son Jakub Pala is Czech and he is married to his American sweetheart Maranda Palova. I am in awe how much they respect each other’s cultures. Maranda took on the Slavic name Palova instead of Pala. 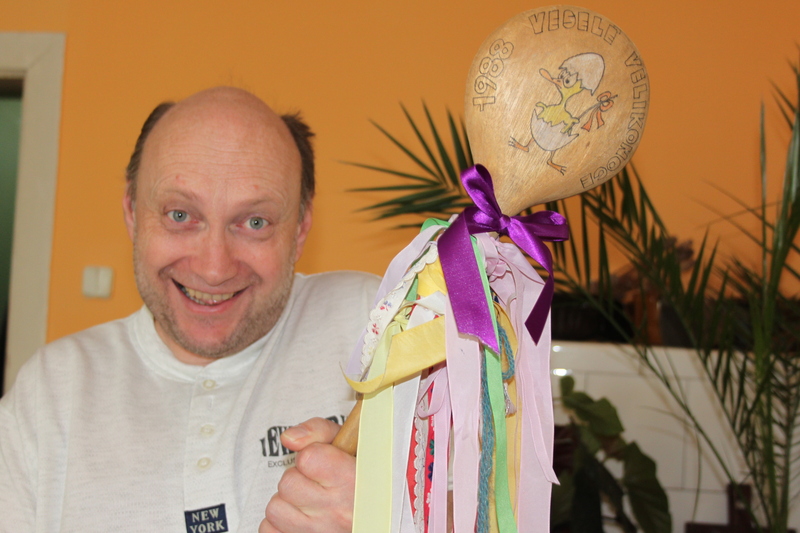 Jakub wants to keep the Czech language for his daughter Josephine. He speaks to her in Czech every evening after work. He asked me if I could give her a book in Czech. Now, that’s a problem here. But, I am a problem solver. 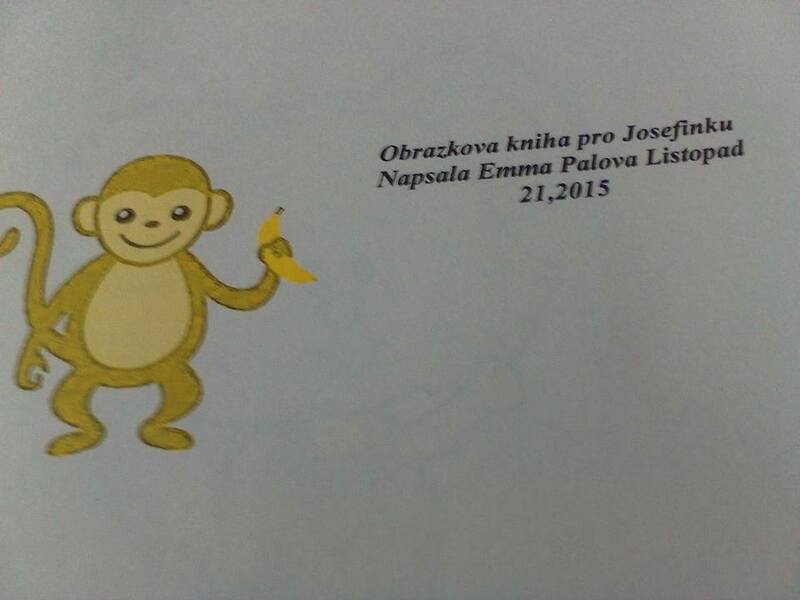 I got up this morning before the birthday party and started working on a simple book in Czech for Josephine. I firmly believe that Josephine will be fully bilingual, which is my son’s dream. I used simple sentences and clip art and I will keep adding pages to the core book and growing paragraphs as she grows. I was most definitely inspired by the blogging challenge to do this. The group pulled me out of my depression. Thank you. We had a great time at this multi-cultural party. Maranda and Jake were awesome hosts in their new home. I am so proud of both of them. They represent the best in the millennials. Thank you for being great hosts and great children. May Day is not only known for the International Worker’s Day to commemorate the Haymarket Affair in Chicago, but it is also a Northern Hemisphere spring festival. It was an official holiday in former Czechoslovakia, complete with parades. But, most importantly, it was and it is a celebration of spring called Majales accompanied by the opening of the beer gardens. 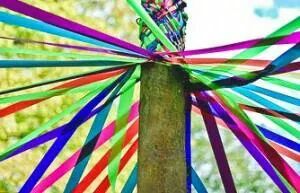 Majales are dances around May poles decorated with ribbons. The first day of May is known as the day of love immortalized by many artists, poets and writers. It was mainly the work of Czech poet Karel Hynek Macha who attached love to this day and the entire month with his poem May. The poem takes place by Doksy and the castles of Bezdez, Pernstejn, Holska and Ralsko point toward east and west, noon and midnight. Castle Pernstejn the setting for the poem May. Czech parks and castles invite to romance many designed in classical English style with strict hedges and groves. 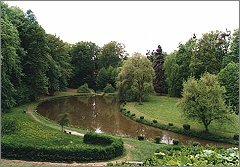 A castle park in Vizovice where a big part of my book takes place. Typical flowers for May are lilacs. Some have grown into trees and have been cross-bred into different colors. Some Czech customs have carried over to the USA. 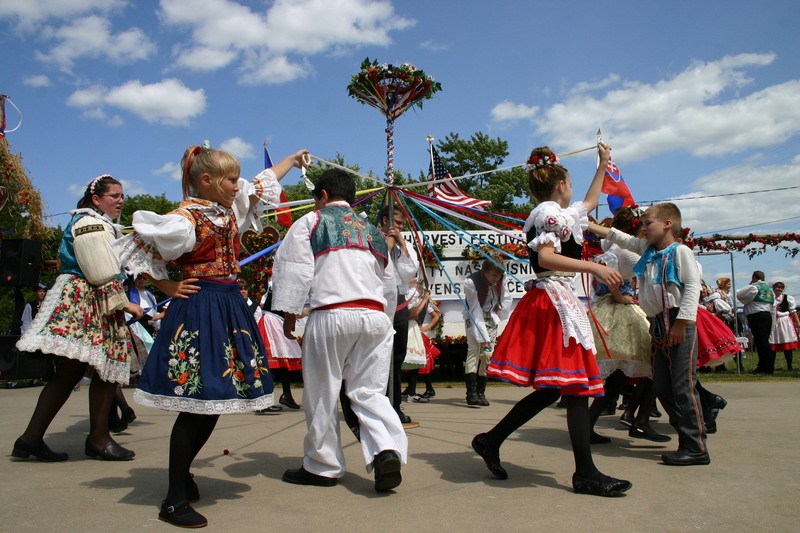 In the photo below, Americans of Czech heritage are dancing around a May pole easily recognized by the ribbons. Lowell, MI-I would like to wish everyone a happy Easter from the EW team. So, you can enjoy it with your family and friends like we do. Our family had to celebrate early, because of our multicultural differences. We had a great time with Maranda, Jake and Josephine Palova. I even got my weight lifting in by throwing her up and down in my arms. She weighs exactly what I lift, that is 20 pounds. For our Easter meal we had fried turkey loins with potato salad. Our appetizer featured open-faced sandwiches and classical Walachian salad or fleisch salad. In the afternoon, we practiced the Czech whipping custom. In turn for whipping, Maranda and I gave shots of plum brandy to the men. 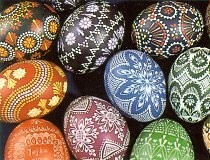 Well, back in Czech Republic, the big day is Easter Monday. Yet to come. Happy Easter to all. You can now subscribe to the Emma Blogs Newsletter.